Are You Appealing to Your Audiences’ Hard Wiring? The raw power of the human brain is an incredible thing and understanding its ever-expanding potential can be intimidating. How we make decisions and why we perform particular actions based on brain activity (e.g., primary sensory areas, gray matter, various lobes, etc.) can be confusing for people just skimming the surface of a niche that continues to grow larger every day. 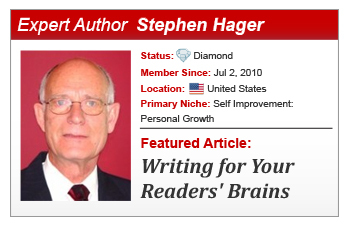 Here’s where Expert Author Stephen Hager steps in with his personable articles that are easily comprehended and enjoyable to read. Passionate about the power and potential of the human brain, Stephen has dedicated his life to serving others and helping them create solutions to their daily challenges. Where there is an intimidating topic, such as how your brain is wired, it’s important to educate while not talking down to your readers. Stephen fosters a climate of trust by easily breaking down principles, providing innovative strategies, and calling for interactive participation. 1. Be passionate about your subject … Commitment to quality authorship is a two-sided coin; as you learn and grow, your readers benefit as well. 2. Focus on the readers’ interests, not yours … Readers, like you, want to receive value from the time they spend learning and educating themselves. 3. Construct your article to reach all sensory and cognitive processing styles … Use graphic images, keep your article in the 400 – 800 word range, have someone edit your articles, and use Key Points with minimal text. What do you think of Stephen’s suggestions? Do you have any additional suggestions or questions of your own? We’d love to hear from you! To read Writing for Your Readers’ Brains in full, click here. Thanks Harold. I can see from your web site that you value the importance of effective communications. When two or more people communicate on each others preferred “wavelengths,” many wonderful things occur. It starts with rapport and a respectful connection; then it moves on to greater understanding, less conflict and shorter communication time. People having different sensory and cognitive preferences frequently experience turmoil in their relationship, seldom able to “connect.” When they know their respective strengths and how each prefers to receive information, they become dynamic duos and sometimes great friends. Our products have been used for over 20 years to improve communication, productivity, problem solving and align brain strengths with great careers/jobs. You can correspond with me with your questions and I will steer you to some free resources to learn more about the power of practical neuroscience. It looks like you already have a keen appreciation for the field. I am a fellow author and would like to feature your story on my blog. Thanks for your kind comment, Tracy. I visited your web site and love it; your books make caring gifts for grandchildren. Deanna and I will make some choices before Christmas. Please let me know what “messages” you want to integrate into future books and articles; what outcomes and behaviors from children/adults are you looking for? I will be happy to write an article or two that helps you; I will also correspond with you personally to give you a helping hand using safe and positive practical neuroscience principles and practices. As a nurse I know how encouragement, positive reinforcement affects children and self esteem. I believe in Erikson’s theory stage, Industry versus Inferiority that children need to feel competent in order for them to feel successful and that it might affect them throughout their lifetime. Yes, kind words and encouragement is uplifting at any age. He’s sure got some spectacular articles here. Excellent reading. Thank you. Lance, it is food and warm feeling to receive positive input that ones passion and work is experienced. Sometimes authorship is a bit lonely and you feel that you are flying alone. wow… really love the way you explained about human beings and brains. sir.. Seeing your “wow” is a “wow” experience for me. Thank you for reaching out! 100% of my articles are grounded in practical neuroscience. I try to make them useful and relevant to improve quality-of-life in ones personal and professional life. I hope you continue to gain value from our work. Hope you continue to scan our extensive “library” of practical neuroscience articles. We have over 100 written and are averaging 1-2 per week. This field seems to be limitless and only limited by ones imagination. This is a great post. How many of us track prospect sentiment to their website, to find the best way to pitch to prospects? We always tweak our website look to make sure that we follow the trends that prospects are interested in. Thanks for the compliment Steve. I am a big fan of market research to learn customer attitudes, sentiments and needs; there is no substitute for direct customer responses that provide relevant information to shape your services. Practical neuroscience methods are effective to convey and exchange information to your readers preferred sensory and cognitive pathways. It’s important to address all combinations of how people prefer to receive and process information. You can look over several articles I have authored where this subject is expanded; you will find research based statistics and specific ways to communicate with your readers. It’s amazing how well practical neuroscience can tip the scales. I like number 3. Along with being passionate about the subject, be very KNOWLEDGEABLE about the subject too. That way you can write and develop new and original content for years to come. The knowledge point you made was a concern for me two years ago when I started writing regularly. Initially I felt there might be about 10 articles inside me and then the well would run dry. What I found was my list of new articles grew each time I wrote one and I am now over 100 articles with no end in sight. This personal experience has strengthened my faith in practical neuroscience and the power of the brain to grow and tap into the portals of memory and consciousness. Thanks for sharing a breakdown of Stephen Hager’s razor-sharp principles to connecting with your audience on an extraordinary and memorable level.